Nothing screams summer like red, white and blue! 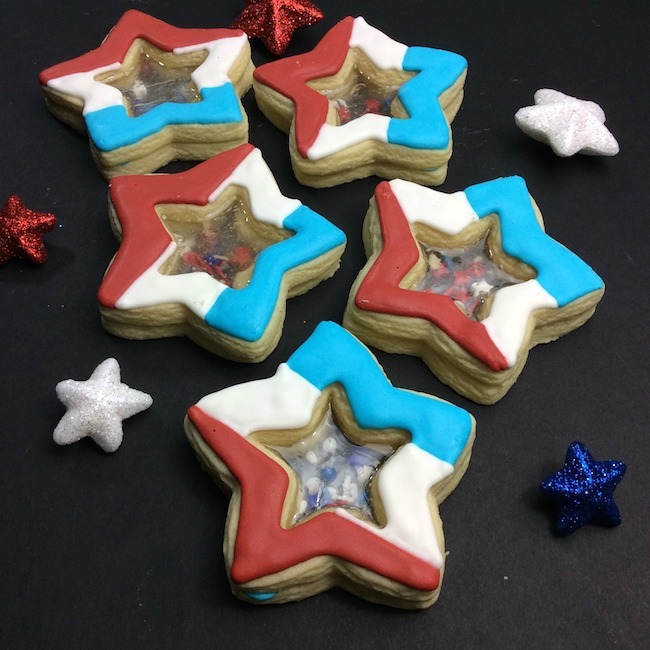 These star shaped cookies filled with yummy goodness in the middle will make all of your family and friends feel a bit more patriotic at any Memorial Day, July 4th or even Labor Day celebration. 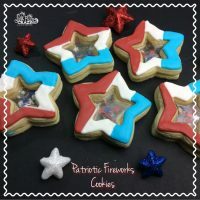 These cookies take a little more work than some of our other 4th of July inspired recipes, but we think the result is so worth it! 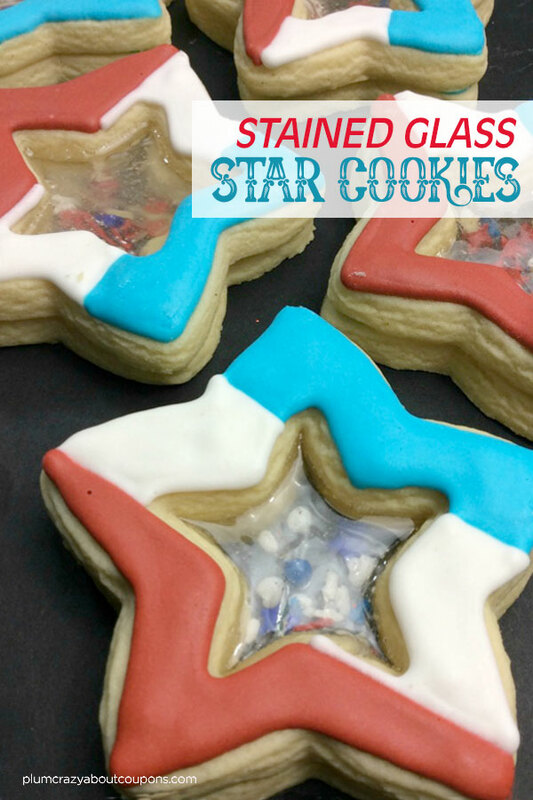 Yummy sugar cookies turned into a stained glass masterpiece will make these the hit of the party. 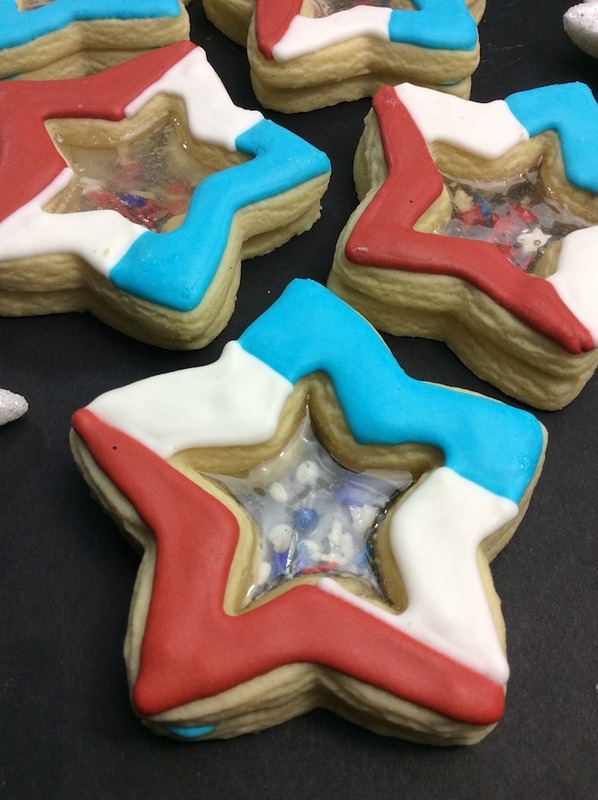 The red, white and blue icing and stars that sit within the clear Jolly Ranchers window are super creative – and of course super yummy. 2. Add eggs and continue to mix. 3. Add the vanilla and continue mixing. 14. 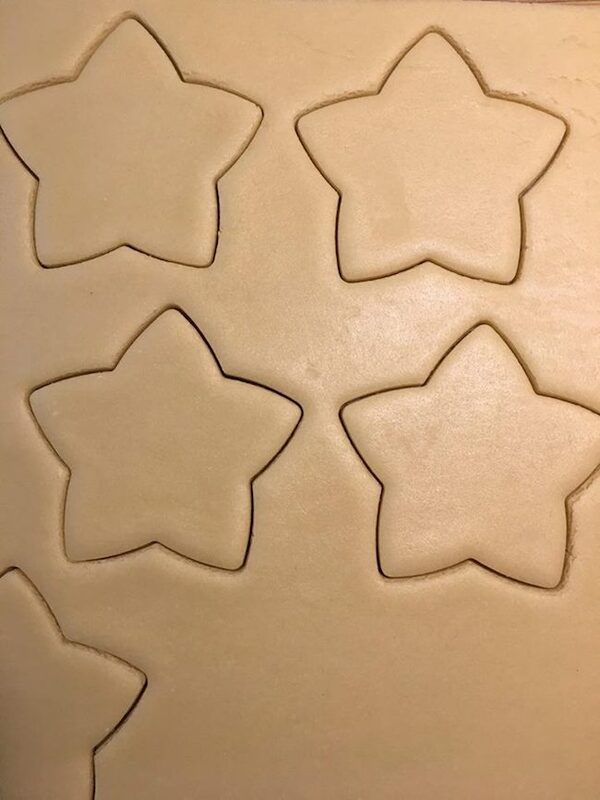 Take out the smaller star and cut out the center. 14. Using a metal spatula move the cut cookies to the parchment lined cookie sheet. 15. Place the cookies on the baking sheet and bake at 325 degrees for 6 minutes. 16. 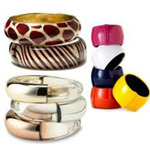 While the cookies are baking, unwrap the candies from the wrappers and set aside. 17. When the timer goes off, pull the cookies out and place 1 candy in the open circle of the cookie. 18. Place back into the oven for another 3-4 minutes, or until you see the candy melted (wont take longer than 4 minutes). 19. Let cookies cool on cookie sheet for 30 minutes before moving the cookies. 1. Combine all ingredients into a stand up mixing bowl. 2. If the icing looks a little soupy add in 1/2 C powder sugar. 3. Mix on medium speed until stiff peaks form, about 5 minutes. 4. Split the icing into two bowls. 5. Add a few drops of Super Red food dye into 1 bowl. 6. If you don’t like the shade of the color, add 1-2 more drops. 7. Add a few drops of blue into the second bowl. 8. Leave the third bowl white. 9. Scoop some of the icing into the 3 piping bags. 10. Using the remaining icing in the bowls, add 2 TBSP water into the bowls to thin out the icing. 11. Pour the thinned icing into the squeeze bottles. 1. 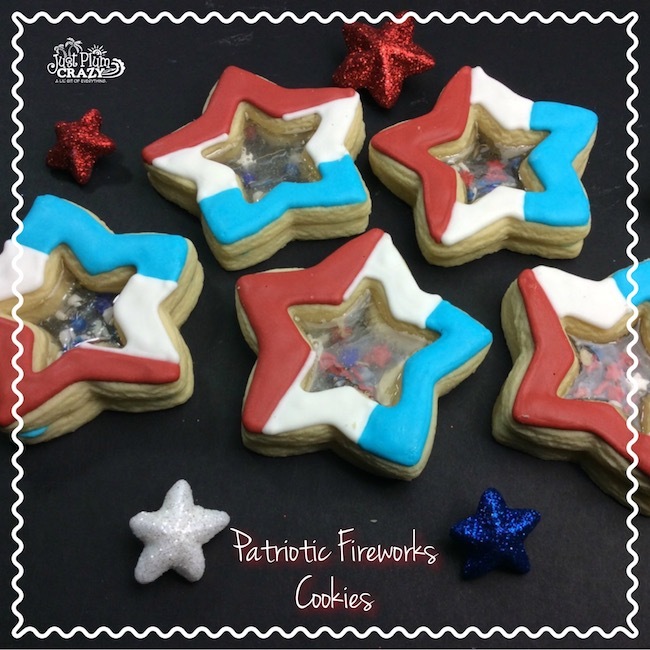 Take your cooled stained glass cookies and set them onto the cookie sheet. 2. 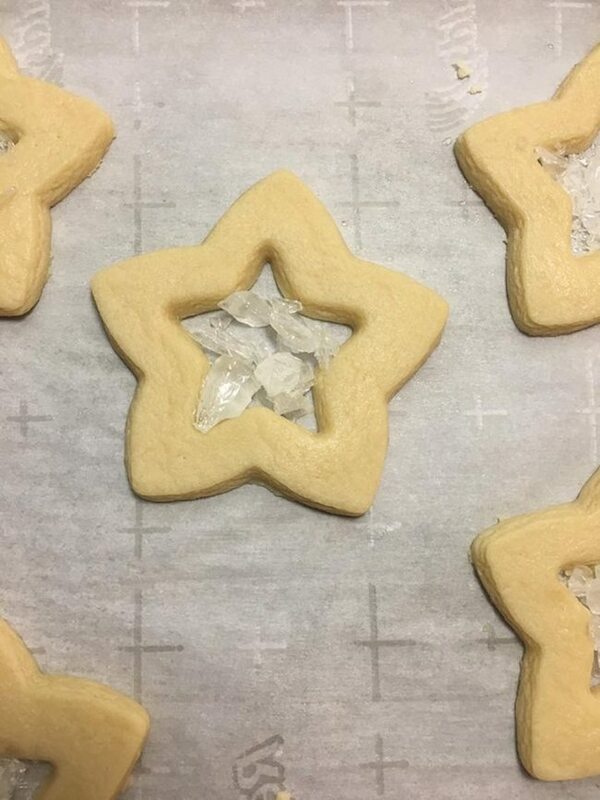 Add a few sprinkles into the “glass” part of the bottom cookie. 3. Take one of your piping bags and pipe on a line around the cookie part of the bottom cookie. 4. Place another cookie on top of the bottom cookie so that the icing becomes a “glue”. 5. Let cookie sit for 30 minutes before decorating the top. 6. 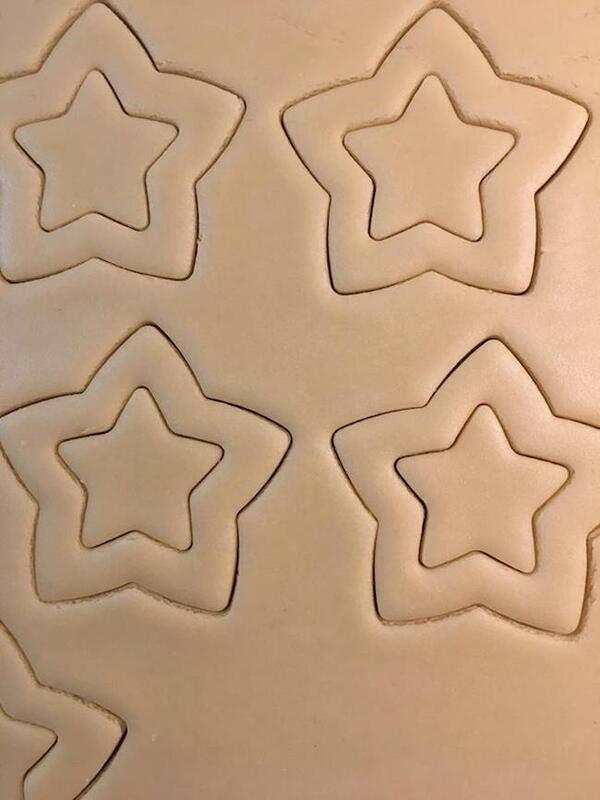 Take the red piping bag and pipe a line on 1/3 of the top of the star. 7. Using the White icing, pipe the middle 1/3 of the cookie. 8. Using the blue icing pipe a line around the bottom of the cookie. 9. Fill in the colors with the matching thinned icing colors. 10. Let cookies dry for 2 hours before enjoying! 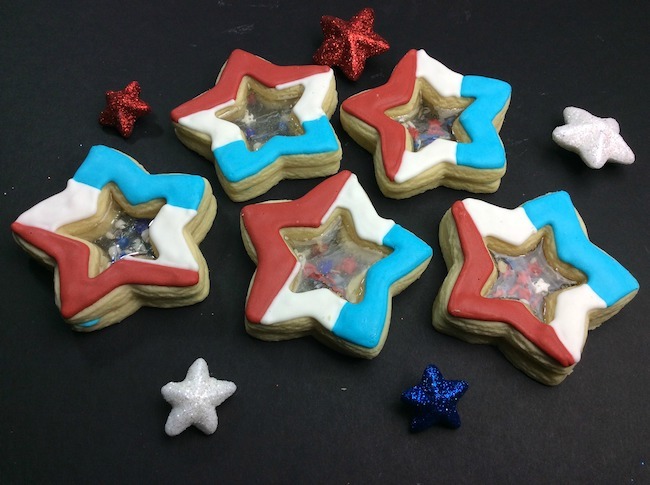 Patriotic star shaped stained glass firework cookies scream USA! Take out the smaller star and cut out the center. Place the cookies on the baking sheet and bake at 325 degrees for 6 minutes. While the cookies are baking, unwrap the candies from the wrappers and set aside. When the timer goes off, pull the cookies out and place 1 candy in the open circle of the cookie. Let cookies cool on cookie sheet for 30 minutes before moving the cookies. Using the remaining icing in the bowls, add 2 TBSP water into the bowls to thin out the icing. Pour the thinned icing into the squeeze bottles. Place another cookie on top of the bottom cookie so that the icing becomes a "glue"
Let cookies dry for 2 hours before enjoying! While I used pineapple Jolly Ranchers to achieve the clear center – feel free to experiment! The pineapple may not be easy to find so you can try lemon as an alternate. But think out side the box too! Play around with the colors by adding a blue or red Jolly Rancher variety in the center to get a more colorful stained glass look. Use gold stars in the middle instead of the red, white and blue version I did. And remember these cookies can be used all year round. 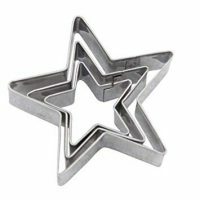 Get some egg or bunny shaped cookie cutters instead of stars, change up the colors and you have an amazing Easter cookie!